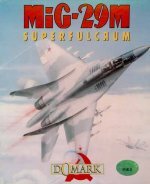 Go to MiG-29 Fulcrum (1990) and read Fausto Romeo's recollection of these two classic sims. Instead of the odd lonely hill, we now had whole mountain ranges to crash into! Three different loadouts were now available, as opposed to one in MiG-29 Fulcrum. The menu screens saw a transition from bitmapped artwork in MiG-29 Fulcrum to 256 colour "photographic" images. Off-boresight - away from the front of the aircraft - targetting and a red line showed you which direction to turn to find the elusive bogey. found him, going for a guns shot.